Community clinics (CCs) were established by the Government of Bangladesh with an aim to extend primary health services to the grassroots population in rural areas. Currently there are 13,500 CCs throughout the country and each covers 6,000 population under its jurisdiction and are meant to provide maternal, child health, family planning and other primary health care services. However, challenges still remain in ensuring accountability, quality and equity in healthcare service at the local level. Voice and accountability mechanism are almost non-existent. There are gaps in logistics, quality assurance procedures and the facilities suffer from high staff absenteeism, unskilled staff and inefficient use of supplies. Stakeholders are not fully aware of clinics' purposes and there is weak communication and lack of involvement of local government institutions. Community clinics, a flagship programme of the Government of Bangladesh, are health facilities set up to deliver primary health care, family planning and nutrition services to rural people at the grassroots level. Currently there are 13,500 community clinics (CC) in Bangladesh, aimed to cover every 6000 rural population. Despite the widespread establishment of the community clinics, challenges such as shortage of supply, provider absenteeism, lack of properly defined roles and responsibilities of human resources, poor behaviour towards patients, weak accountability and governance, and absence of active participation from community in healthcare delivery restrict efficient use of these facilities and available resources. To complement the monitoring mechanism of community clinics, the Future Health Systems (FHS) Bangladesh team at icddr,b aimed to implement a community scorecard (CSC) to ensure community participation and provider accountability in the local health system. This FHS Research Brief presents the learnings from the three cycles of community scorecard implementation in the intervention community clinics. Iron-deficiency is the most common nutritional deficiency globally. Due to the high iron requirements for pregnancy, it is highly prevalent and severe in pregnant women. There is strong evidence that maternal iron deficiency anaemia increases the risk of adverse perinatal outcomes. However, most of the evidence is from observational epidemiological studies except for a very few randomised controlled trials. IFA supplements have also been found to reduce the preterm delivery rate and neonatal mortality attributable to prematurity and birth asphyxia. These results combined indicate that IFA supplements in populations of iron-deficient pregnant women could lead to a decrease in the number of neonatal deaths mediated by reduced rates of preterm delivery. In this paper, we describe the protocol of a community-based cluster randomised controlled trial that aims to evaluate the impact of maternal antenatal IFA supplements on perinatal outcomes. Nutrition has been integrated within the health services in Bangladesh as it is an important issue for health and development. High penetration of mobile phones in the community and favourable policy and political commitment of the Government of Bangladesh has created possibilities of using Information Communication Technology such as mobile phones for nutrition programs. In this paper the implementation of nutrition services with a specific focus on infant and young child feeding was explored and the potential for using mobile phones to improve the quality and coverage of nutrition services was assessed. 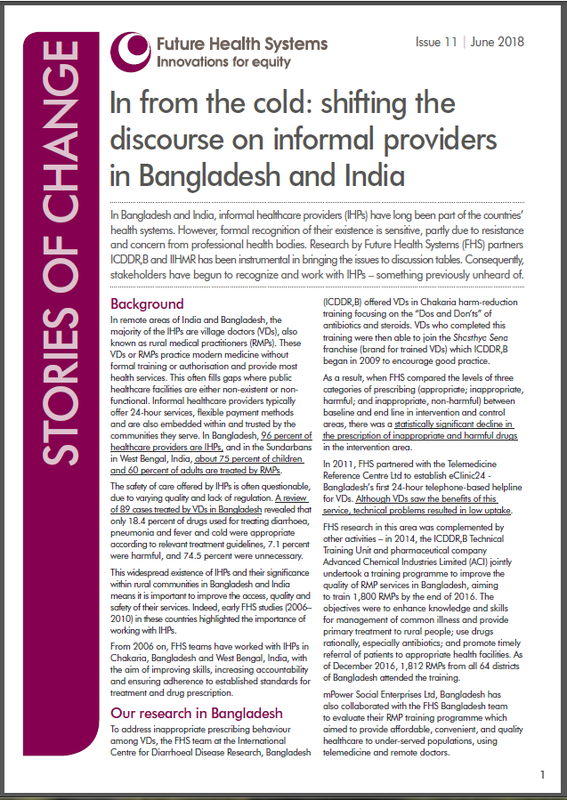 In Bangladesh and India, informal healthcare providers (IHPs) have long been part of the countries’ health systems. However, formal recognition of their existence is sensitive, partly due to resistance and concern from professional health bodies. Research by Future Health Systems (FHS) partners ICDDR,B and IIHMR has been instrumental in bringing the issues to discussion tables. Consequently, stakeholders have begun to recognize and work with IHPs – something previously unheard of. Effective public policies are needed to support appropriate infant and young child feeding (IYCF) to ensure adequate child growth and development, especially in low and middle income countries. The aim of this study was to: (i) capture stakeholder networks in relation to funding and technical support for IYCF policy across five countries in South Asia (i.e. Sri Lanka, India, Nepal, Bangladesh and Pakistan); and (ii) understand how stakeholder networks differed between countries, and identify common actors and their patterns in network engagement across the region. The health hazards associated with the use of smokeless tobacco (SLT) are similar to those of smoking. However, unlike smoking, limited initiatives have been taken to control the use of SLT, despite its widespread use in South and Southeast Asian countries including Bangladesh. It is therefore important to examine the prevalence of SLT use and its social determinants for designing appropriate strategies and programmes to control its use. Health literacy (HL) helps individuals to make effective use of available health services. In low-income countries such as Bangladesh, the less than optimum use of services could be due to low levels of HL. Bangladesh’s health service delivery is pluralistic with a mix of public, private and informally trained healthcare providers. Emphasis on HL has been inadequate. Thus, it is important to assess the levels of HL and service utilization patterns. The findings from this study aim to bridge the knowledge gap.